ideal for business and residential use. Straight wall metal buildings are ideal as storage buildings in a residential area as they conform to the look of typical wood structure homes with a variety of color combinations to blend right in. Store lawn equipment, recreational vehicles, overflow from the house, collectibles or anything you need space for. The insulated walls and roof and tight seals keep your contents safe from outside intruders or moisture. 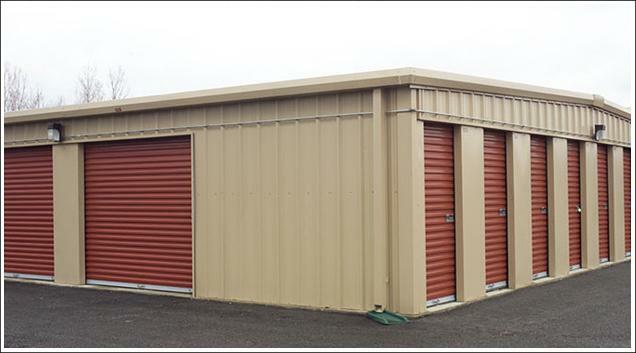 Commercial storage units are mostly metal building kits. They are economical and sturdy enough to withstand severe wind and heavy loads so they are the best choice for commercial storage facilities. Units come with roll up doors for each garage unit and are walled off with 20 - 28 gauge steel cladding. Often commercial storage facilities require extra strong walls so we can customize the cladding to be 20 gauge steel including the roof. The price of a metal storage garage or building is lower than concrete block construction and requires less maintenance. The exterior paint is applied using a new silicone protected polyester technology using special pigments designed to reflect infrared energy while absorbing visible light. Our 40 year warranty on paint is the best in the industry and assures your metal storage building will look beautiful for decades. The alternative is to pay for a storage unit on a monthly basis but if you require a longer or permanent storage facility you can save thousands by erecting your own metal storage building and it will most likely pay for itself in a couple years. You can expand your building at the end to generate more pace and length. The clear span system using main frame red iron welded beams support a clear span interior with no beams or posts or trusses so you have more storage space. Add a cross ventilation system to keep the interior fresh with wall louvers and turbine vents on the roof. Chose from several industrial type roll up door systems for the best security. They come in 16 - 26 gauge steel and are available in sizes up to 30’ wide to 28’ high. Customize your storage building with windows or walk through access doors. The pre-engineered system is easy to construct using pulleys or cranes and bolting together all the components using the included hardware and our step by step instruction manual. If you require complete turnkey construction of your project, our experienced contractor services department will assist you in getting the job done right or send field construction consultants to assist your local contractor. Go to our online metal building kit price calculator and enter in all the specs and accessories to custom design your storage building, enter the location and get instant quotes on what your building would cost. Or call us and start the conversation today to begin a consultation for your new metal building.